Art Opening in Brookland TONIGHT - "Night on Ninth"
What: Golden Dream Pop-tail, featuring artwork by Clark, Billy Colbert, Emily Greene Liddle, Mary Annella Frank, Chris Lee, and Candice Keegan. Live music by the Gulley Jimson Quartet. When: Opening reception Friday, June 30th, 2006, 6-9pm. Runs through July 15th, 2006. Regular gallery hours: Thursday & Friday 4-8pm, Saturday 12-4pm. About: This is part of the six two-week summer art exhibitions: Shaken, Not Stirred...An Ephemeral Cocktail. Washington Works on Paper is a not-for-profit gallery; all proceeds go to cultural art programs in Brookland. I know it's been circulating around the local interwebs, but I wanted to give credit to a neighbor from Friends of the Earth who passed this info along to me. Thanks, neighbor! 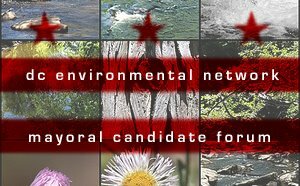 What: District of Columbia environmental organizations, individuals and activists to hold a Mayoral Forum featuring issues highlighted in the soon to be released DC Environmental Agenda. Candidates will have an opportunity to present their environmental vision for the District to residents and explain their thoughts on issues that most directly impact the environmental health of our communities. Organizations that are interested in tabling at the event should contact the Washington Area Bicyclist Association / WABA. Free valet bike parking will be available at the forum courtesy of WABA. Why: In 1999, twelve District environmental organizations created the first ever Environmental Agenda for the District of Columbia. This agenda was a collaborative effort of citizen activists to chart a course for environmental protection. It recognized that a new Mayor and Council would have an opportunity to reverse some of the negative trends of years past and promote working towards a more livable city for all residents. It made recommendations, for action and drew upon the collective wisdom of many District environmental leaders as well as successful initiatives in other parts of the country. · Clean Rivers - While some progress has been made cleaning up the Anacostia River, Potomac River and Rock Creek, much work still needs to be done. Recommendations will include doing more to effectively manage stormwater and increase efforts to find funding for important repairs to our aging infrastructure. · Safe Drinking Water - With efforts to decrease the amount of lead in our drinking water under way, recommendations will focus on making sure we avoid a future drinking water crisis. · Solid Waste - Making sure real progress is made in implementing both curbside and commercial recycling efforts will be an agenda focus. Ways in which the District can expand and enhance other successful solid waste programs will be highlighted. · Public Health - With the increased prevalence of toxic chemicals in our communities and bodies the public health section will focus on implementing a biomonitoring program that will test for toxics in people. A first step towards developing effective policies that will protect District residents. · Protection of Parks and Trees - Although significant progress has been made, we still have much to do to reverse 30 years of tree canopy loss. Recommendations focus on the development of comprehensive strategies and management systems to plant and care for trees on both public and private property. · Transportation - Creating Complete Streets: DC transportation planning, design and construction should result in streets that are designed with bicyclists, pedestrians and transit users in mind. The use of alternative modes of transportation should be encouraged through changes in parking and tax policy, and zoning regulations. · Green Schools - Greening D.C.’s schools and making sure our children have a safe place to learn and grow will be a focus. · Global Warming - A new and significant addition will be global warming recommendations for candidates about local solutions such as clean car legislation. · Smart Growth Platform - Directing the region’s growth near metro stations, reinvesting in parks and public spaces, implementing the Comprehensive Housing Strategy and increased support for walking, bicycling and transit will be incorporated. · Homeland Security - Implementing policies that stop terrorists from having the tools to create chemical and other environmental threats that could potentially kill thousands in our region will be an important element. · Food Safety and Security - Promoting greater food nutrition education, bringing local healthy food to school cafeterias, securing markets for local producers, and increasing the availability of fresh produce to lower-income neighborhoods is the focus of our recommendations in this section. · Budget Transparency - Recommendations to make the DC government’s budget process more accessible and transparent. I've also been alerted that both Marie Johns and Vincent Orange may be able to attend. Finally, I'm available to attend a forum; personally, I want to hear what Johns has to say. At the same time, I look forward to the amusement Orange's environmental platform would bring...I envision something along the lines of, "I brought you a Home Depot [insert pat on back]. Only in Ward 5 can you purchase their sustainable wood and lead-free pipes....What about that Giant? They have three organic cereals! 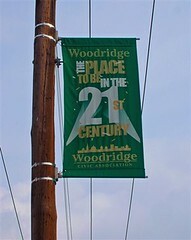 And no trees were hurt in the process of plastering my campaign swag across the District...."
I haven't been keeping up on this debate as much as I should, but there's been a bit of grumbling on the Brookland listserv about what should be done with site. The DC Preservation League continues to list McMillan as one of DC's most endangered places (page 4) and "...welcomes limited development on this site, and encourages NCRC to work with preservationists, the city's Office of Planning and Historic Preservation Office, and the interested community groups for a mixed use development that preserves the historic character of this site as well as open space for the community." Now that NCRC owns the site, I imagine community input is critical at this stage. If you are able to attend, please leave your observations/opinions in the comments. 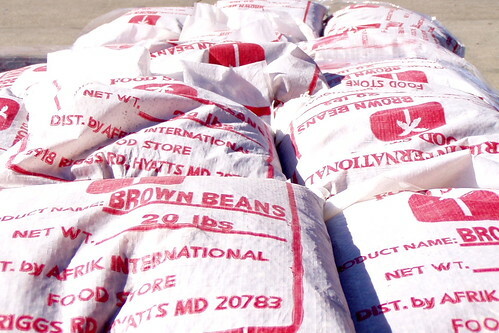 The Capital City Market, more commonly known as the Florida Market, is the primary wholesale food distribution center in the city. A number of the businesses sell to retail customers. The cinder block "DC Farmers Market" building on Neal Street is comparable to Eastern Market, except it is privately owned, and a lot less pretty. The market area is under great development pressure because of its location and the attractiveness of the New York Avenue subway stop. The Office of Planning Cluster 23 Study proposes that the market be revitalized through a food-centered plan. An alternative proposal suggests demolishing everything and starting over. We're interested in showing people the assets that the market has to offer. On Saturday, Elise Bernard of the Frozen Tropics blog, and I will lead a free tour of the market. It will start at 9:00 a.m. at 4th and Morse Streets, NE. We will then go eat at Young's Deli (inexpensive Korean and other foods). People could join us at 9:40 at Young's (300 block of Morse St., NE) for the rest of the tour if they are not up for kimchee. We will then visit eleven other places that sell retail, including the multi-vendor cinder block "Farmers Market" and the outdoor flea market, before finishing at Litteri's, which in my opinion, has the best Italian sub sandwich in the city (sorry Vace, sorry Mangialiardo's). We should finish up around noon. We will repeat the tour on Saturday, July 29, at 9 a.m., beginning at the same meeting place. Come mingle, network and nibble! Doors open at the Brooks Mansion (901 Newton Street, NE) at 6:00 PM, Monday, June 19, 2006! The Brookland CDC is pleased to announce we will be holding our annual meeting on Monday, June 19, 2006, at 6:00 PM. The meeting will be held at the Brooks Mansion in the Brooks Room. The evening's program is an exciting one! Please join us as we introduce and welcome our new executive director, Lee Alexander. John McGaw from the Office of the Deputy Mayor for Planning & Economic Development will give a presentation on the progress of the Historic Brookland Main Street program and will introduce our new program manager, Tom Litke. Upcoming projects and activities will also be presented for the community to provide input and direction as well as participation opportunities. Please RSVP at your earliest convenience to: Lee Alexander, 202-529-8400 or brooklandcdc@aol.com. Bill 16-734, the "Library Transformation Act of 2006"
On Thursday, June 15, 2006, Councilmember Kathy Patterson, Chairperson of the Committee on Education, Libraries and Recreation, will hold a public hearing on Bill 16-734, the Library Transformation Act of 2006. This legislation represents the Mayor's proposal to finance and construct a new Martin Luther King, Jr. Memorial Library at the old convention center site. The hearing will be held at 10:00 am in the John A. Wilson Building, 1350 Pennsylvania Avenue, N.W., Council Chamber, Room 500. The Committee invites the public to testify or to submit written testimony, which will be made a part of the official record. Anyone wishing to testify at the roundtable should contact Evelyn Bourne-Gould, Legislative Assistant to the Committee on Education, Libraries and Recreation, at 724-8195, or via e-mail at egould@dccouncil.us. All witnesses will be permitted a maximum of three (3) minutes for oral presentation. If you are unable to testify at the hearing, written statements are encouraged and will be made a part of the official record. Copies of written statements should be submitted either to the Committee on Education, Libraries and Recreation, or to Mr. Ira Stohlman, Acting Secretary to the Council, Room 5 of the Wilson Building, 1350 Pennsylvania Avenue, N.W., Washington, D.C. 20004. The record will close on Thursday, June 22, 2006. "Library Transformation Initiative: A New Chapter in DC Public Libraries"
"The District of Columbia: A New City Center"
If you haven't had the chance to keep up with the debate about Douglas Development Corporation's proposed 90'/9 story apartment building (on Lot 821 in Square 3822 where the Precision Tune lot is) on the Brookland listserv, start here (you must be a member). The dialogue continues on a number of threads, highlighting both the perceived pros and cons of the development. I must say that I am glad the tone has been civil thus far, and, though still fresh, hasn't succumb to what I'd call the St. Martin's Syndrome - for which I and a number of other folks were kicked off the Ward 5 listserv, but I digress. 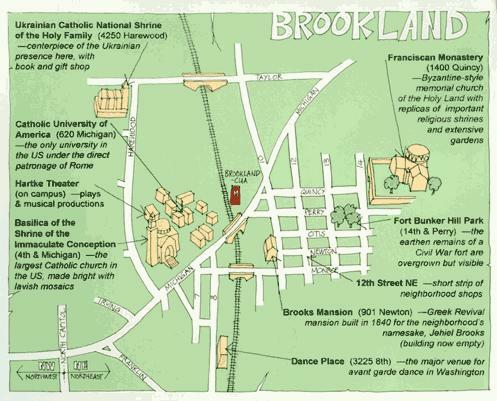 In general, with the limited knowledge I have about the proposal, I am tempted to believe it is a good idea to develop the area around the Brookland-CUA Metro. I do not, however, think that an apartment complex - workforce-based or not - within walking distance to both the train and a number of busses requires 400 parking spaces. I'm looking forward to the evolution of this discussion and would love to get feedback/notes from the meeting (I'll be at a longstanding commitment this evening). A self-empowering safety project is being launched in your community. Join your neighbors and participate in the "Light Up the Night" program. The next meeting is scheduled for 7pm Tuesday, June 13th, 2006 at 3420 9th Street, NE (across from Colonel Brooks Tavern). For information, call Ms. Perkins at 202.724.8028 or Ms. Ward at 202.526.4508. 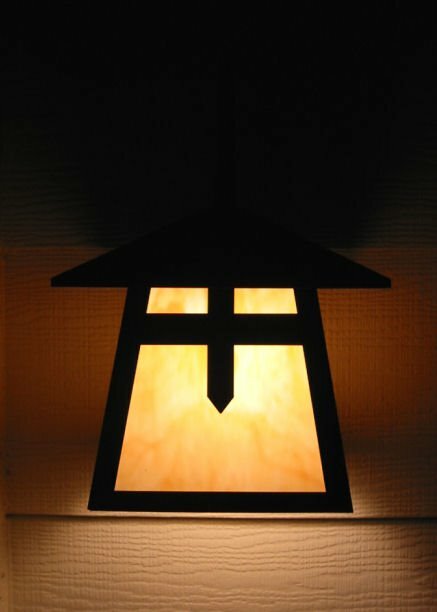 My mom taught me early on the value of leaving our porch light on. I often wonder if folks don't do it because they're worried about the cost (never mind the lights we all leave on in rooms we're not in). Energy-efficient fluorescents - available just about everywhere - are definitely the way to go. Sure they cost more, but you get your money's worth both on your PEPCO bill savings and in not having to change the bulb nearly as frequently. Worried about attracting bugs during the warmer months? You can save energy and keep the pests away. Such a small effort from all of us can really make a large impact in making our streets safer at night! At approximately 7:30 this morning, Wednesday, June 7, 2006, police were called to the rear of 1617 Isherwood Street, NE, for the report of a stabbing. Upon arrival they located 39-year-old Dion Butler, of no fixed address, suffering from apparent multiple stab wounds to the body. He was taken to the Washington Hospital Center's MedStar Unit and pronounced dead. More than a dozen homes, organizations and businesses with a wide variety of architectural styles, garden sizes and designs will be open to visitors. Homeowners and docents will be available at each property. All profits support Brookland pocket gardens and street tree plantings. Guided tour mini-bus leaves Brooks Mansion at 12:30 p.m. First come, first served! DATE/TIME: 11 June 2006, Tours 12:00 - 5:00 p.m.
TICKETS: $12.00 pre-tour and $15.00 the day of the event, cover the cost of the tour and the reception. Tickets can be purchased at Petals, Ribbons & Beyond, at 3906 12th Street between the hours of 10:00 a.m. and 7:00 p.m. From mid May through June 11. Also on sale at Keller Williams Realty, 2701 12th Street NE. LOCATION: Properties throughout the Brookland neighborhood in NE DC. Want to host a garden party for 2007? Email Jeff, Jeff@gbgc.org. Come see the downtown library renovation design that the mayor doesn’t want you to know about. 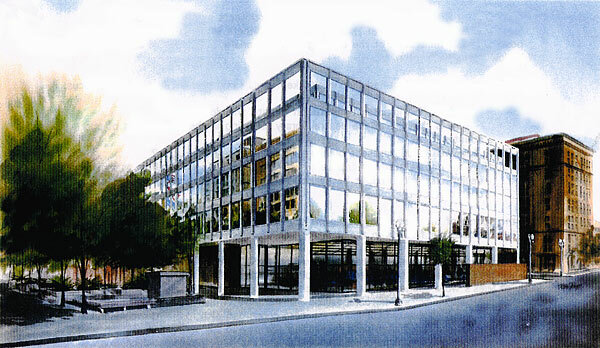 Learn the history of the first public building in the country dedicated to slain civil rights leader Martin Luther King, Jr., the only library in the world designed by famed architect Ludwig Mies van der Rohe, and the first District building constructed under Home Rule. Undertaken by local architects at the library’s request in 2000, this design study for the renovation of MLK library was created in collaboration with library staff and users, resolving the problems they identified in an innovative and dramatic fashion. Overlooked at the time and ignored since, you can see the vision for MLK's future that the mayor's “Blue Ribbon” library task force was not shown. Become fully informed about all options before the June 15 City Council hearing on the mayor’s plan to abandon the historic, stand-alone MLK library in favor of a new central library to be part of “mixed use” development at the site of the old convention center. Your questions and concerns will be addressed by Kent Cooper, AIA, original lead architect of the design study, in an open Q & A. Unfortunately it's too late for me to go in depth on my opinions on the "options" the Mayor (some of my arguments are in the comments of the DCist post) and the Blue Ribbon Task Force have presented us thus far. In general, I believe we should hear both sides, and this teach-in is a good opportunity to do just that before next week's public hearing. Also see Richard Layman's most recent MLK post, with relevant links, here. Below is a copy of an e-mail sent by Fran Buckley, Interim Director of the DC Public Library System earlier this evening. The Board of Library Trustees has informed Mr. Buckley that his services are no longer needed, that they will be bringing in a "transition manager" and that the head of Personnel for DCPL, Ellen Flaherty, has been put in charge of daily operations. At this time, the Board has called no public meeting to enter these decisions into the public record. I will let you draw your own conclusions on how the staff of the Library System are feeling right now. I can only say as a Friend of the Library that I am very concerned about these actions and how they will affect the ability of the public to receive service during this transition. I want to thank everyone for their support, assistance, and friendliness for the past 13 months I have been here. It has been a pleasure to work with all of you. I have enjoyed, once again, being in the public library environment. I think we have made significant progress on a number of fronts: supporting and assisting the Mayor's Blue Ribbon Task Force with information and listening sessions, purging the patron and circulation files, revising the fine and circulation policies in preparation for issuing overdue notices, making the difficult recommendation to terminate inadequate plans for reconstruction of the four closed branches, developing plans for interim branches, issuing patron behavior guidelines, developing FY 07 operating and capital budgets to support the transformation of the library, increasing the quality and quantity of library programming, acquiring increased resources from the Washington Post clipping morgue to large print and literacy materials, finally getting wireless operational in Georgetown as a precursor for all branches, developing plans for a major upgrade and increase in our PC configuration, and building closer relationships with our patrons, Friends groups, the DCPL Foundation, the City Administration, the Institute for Museum and Library Services, and other organizations. The Board of Trustees has informed me that my services as Interim Director will no longer be needed effective June 1. They plan to bring in a Transition Manager and to appoint Ellen Flaherty to be in charge of day-to-day operations until Ginnie Cooper comes. I plan to return to retirement. See you at the meetings? District authorities are investigating an incident that led a Metro Transit Police officer to open fire on a vehicle early Tuesday morning. The officer said he was heading to the bus depot on Bladensburg Road in northeast Washington around 3:30 a.m. when a car allegedly tried to run his cruiser off the road at 20th Street and South Dakota Avenue. Investigators said the officer pulled the car over, and it was during that traffic stop that a second vehicle allegedly tried to run him over. Police said the officer fired three shots at the second vehicle, but it's not known if anyone was struck. The Metro Transit officer was not injured. The second car got away, but in the first car, boxes of liquor were discovered that police believe were stolen in an overnight burglary at a liquor store in the 3900 block of 12th Street in Northeast. The driver was taken into Metro Transit police custody as a possible suspect. Police believe both cars were involved in the burglary. Somehow I missed the end of the investigation while waiting for the bus this morning...wow. It's satisfying to see stupid crooks, though. Who else would call attention to themselves (with a trunk full of stolen liquor) by trying to run a Metro Transit cruiser off the road? Good job Mr. Metro Cop! Metro Transit Police arrested a Northeast D.C. man in the early morning June 6th for allegedly assaulting an officer while fleeing from the scene of a burglary. Police arrested a 23-year-old suspect after the 3:30 a.m. incident at South Dakota Avenue and 20th Street in Northeast. A two-year veteran of the Metro Transit Police force was on duty in the 2200 block of South Dakota Avenue in a marked police vehicle when a maroon Oldsmobile approached the car and made an apparent effort to run the officer off the road. The vehicle stopped at 20th Street and South Dakota Avenue and the driver bailed out of the vehicle. The 23-year-old officer was pursuing the suspect on foot when the driver of a full size, silver colored car attempted to run over the officer. Fearing for his life, the officer fired several rounds from his service weapon at the vehicle, which sped away, said MTPD Capt. Mike Daly. The driver of the Oldsmobile then attempted to carjack a red Geo that had stopped at the scene. The officer arrested the driver after a brief struggle. The driver of the Geo left the scene. The officer was not injured. Police later learned the Oldsmobile was stolen, and D.C. police are investigating whether the Oldsmobile and other car were involved in a nearby liquor store burglary after 3 a.m. in the 3900 block of 12 Street in Northeast. Transit police expect to charge the suspect with assaulting a police officer and stealing a vehicle. D.C. police also are expected to file charges in the case. Police are looking for the driver of the silver colored full size car, possibly with D.C. tags and would like to speak with the driver of the Geo. Anyone with information about the case is asked to call Metro Transit Police at 202-962-1792. 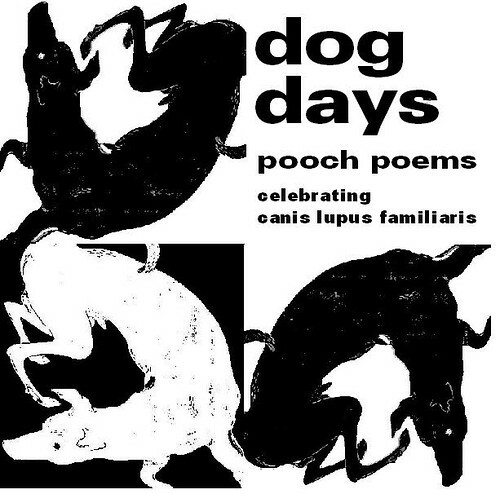 What: Brookland Area Writers & Artists "Dog Days 3" - the return of their most popular reading, dog-related poetry. All readings are free and open to the public. At approximately 6:31 last night, Sunday, June 4, 2006, police were called to a private home located at 1714 Lyman Place, NE, to investigate the trouble. Upon arrival officers located 41-year-old Timothy Fitzgerald Marshall, of the Lyman Place address, suffering from apparent trauma to the head. Members of the DC Medical Examiner's Office responded to the scene, but found no signs consistent with life and Mr. Marshall was pronounced dead. The above case was closed with the arrest of 37-year-old Lee Mario Smith also of the Lyman Place address. He was charged with Murder II. On Friday, June 2, 2006, at about 9:15 am, a cigarette lighter that resembles a semi-automatic handgun was found in the possession of a 9th grade student who attends McKinley Tech High School, located at 151 T Street, NE. During the security screening process at the school, a Hawk One Security officer discovered the cigarette lighter handgun replica in the female student's book bag, sandwiched between two slices of bread and wrapped in aluminum foil. The student was suspended. It is unclear why she brought the cigarette lighter handgun replica to school. This matter was handled entirely by the school. No criminal charges are pending. Kudos to the school security for finding the "weapon." Again, we must invest in and engage our youth. While I agree with the suspension, what happens from there? Yesterday afternoon 22-year-old Carrington Lewis Hooper was found fatally stabbed in the 3100 block of Newton Street, NE. All we seem to know now is that the police were called to respond to an "aggravated assault." You can also view the MPD news releases on yesterday's traffic snarls here and here. It's difficult to overlook the fact that those arrested in the stolen vehicle are ages 14 (! ), 18, and 20. At this point I don't know what else to say other than the undeniable fact that we must continuously invest in and engage our youth. While I don't intend to post only the bad news here, I do want to highlight crimes/incidents that are often overlooked in our every day news. I know that before I started tracking every RSS feed, community listerv, and Google Alert I can get my hands on (and the time to read), I was often oblivious to the events around me that weren't reported in the Post or on the evening news. I want this blog to be a good home base to find and share information, but it can not - and will not - be limited to the negative. That being said, without the impetus from knowing about the negative events, we may be less committed to being the positive change we want for our community. Complacency will not lead us to progress. So, on to the good news . . . . With some relatively cooler weather on the way, this weekend will be a great time to support our local businesses, including Dwellings, Café Sureia, Basements & Attics, Rita's (2318 Rhode Island Avenue, NE), Carl's Subs (2208 Rhode Island Avenue, NE), and Saint's Bourbon Street (1812 Hamlin Street, NE). Where else do you like to go? Around 7am four suspected carjackers were arrested after crashing into several cars and flipping "their" SUV on New York Avenue, NE near Bladensburg Road. Then, at aproximately 8:20am, a gasoline tanker collided with a tractor-trailor on Kenilworth Avenue at Eastern Avenue. The cab of the tanker caught fire; luckily the 7,000 gallons of diesel fuel it was carrying did not. Inbound New York Avenue has reopened, but those using both northbound and southbound 295 should look for alternate routes. Be careful!